Many people have a love-hate attitude towards supermarkets. They can be seen as a massive convenience to which we have succumbed, reducing the tedious process of daily food shopping to a bearable once a week exercise. We have better things to do with our time, we say to ourselves. We promise to trek to the farmers’ market to buy our locally sourced fruit and vegetables, but rarely do. If there’s something similar on the supermarket shelf, it’s so much easier to pop it in the trolley. After all, what would happen to the poor Kenyan ladies toiling away in the sun, if there was no market for their fine beans? Small food producers are similarly ambivalent when Tesco buyers come sniffing at speciality food exhibitions. They have visions of their preciously packaged labours of love being whisked away out of their control. Horror stories abound where supermarkets make promises about buying in volumes which are subsequently not honoured? Where fledgling companies have over extended themselves to build factories to cope with the anticipated increase in demand from their new customers,to find that, 6 months later, the volume required is drastically cut. The brand new production plant suddenly seems like a very expensive new toy. Supermarkets are very aware of their bad press in this respect, but also of the value of partnering with beloved artisan brands with an increasing foodie culture. However, the concept of partner is more relevant with some supermarkets than others. By the time a producer has reached the stage of being noticed, it will have already have built a brand which is well tried and tested in independent and premium retailers. The supermarket will want to undercut these rivals in return for the increased volume, so margins are squeezed. But it is a different story when the approach is not just wanting to stock you but to buy your company lock, stock and barrel. Tesco’s own margins in the last couple of years have not been so sweet, which has resulted in a long hard look at themselves. The relentless expansion in their giant superstores and constant repetition of “every little helps” is wearing thin, and the bolting on of well run independent brands is an easier and quicker fix to refresh a tired global brand than a major revamp of the stores themselves. So, earlier this year Tesco completed partnership arrangements with some new niche London-based independents. 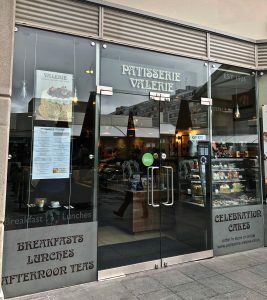 These included the artisan Euphorium Bakery, and Harris & Hoole, a coffee bar chain set up last year by the founders of Taylor Street Baristas. 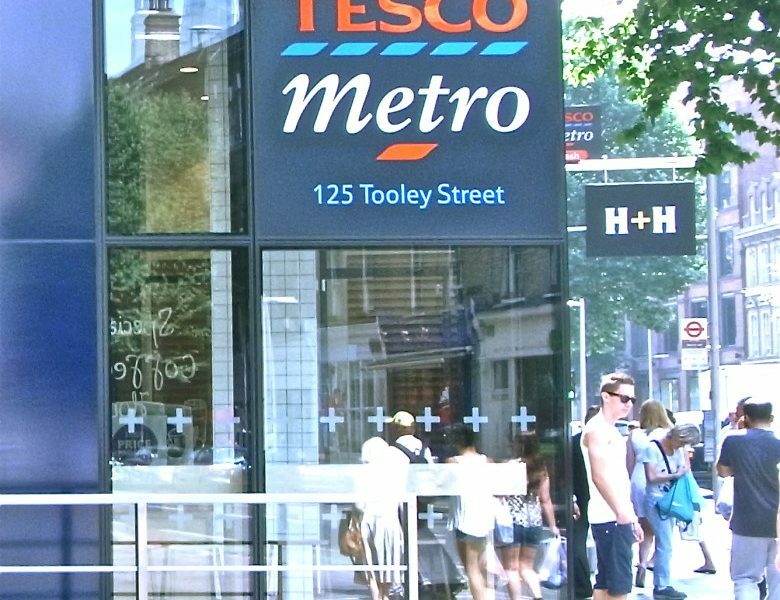 These are both at the Tooley Street branch of Tesco Metro, which is surrounded by office developments including the tall buildings of More London. Euphorium has a prime site at the bottom of the entrance escalator. Being visible right from the top means there is plenty of time to absorb it as you descend. Its layout, typical of an independent with a large amount of floor space partially taken up in the centre with a generous round table attractively displaying bread and pastries to take away. So far, so not Tesco. The sandwiches look gorgeous: well lit, with fillings oozing. I tried the hand cut bread filled with crayfish mayonnaise, capers and rocket at £3.90 (although charged I saw later at the Tesco till at £3.75). The capers lifted a ubiquitous filling into a new sphere, and the bread was properly homemade. The charming Italian sales assistant, Giuseppe, waxed lyrically about the food as I was looking, and pushed me into trying a Parma ham salad with aubergine, mozzarella, semi-dried tomatoes, yellow cherry tomatoes with a well made balsamic dressing, because it reminded him of Sicily. The menu is well balanced with plenty of varieties of bread, as you would expect from a bakery. Filled sections of granary or white baguette contain the more accessible fillings: smoked chicken, ham and gruyere, cheddar cheese and tuna mayonnaise, ranging in price from £3.70-3.90, while hand cut bread, poppy seed rolls and ciabattas take care of the more unusual types: with Parma ham, Scananavian flaked smoked salmon or Shredded beef with truffle oil, for example. The salads are displayed in flat cardboard boxes with a large cellophane window for visibility, priced at either £4.50 or £6.50. The swathes of cold rare roast beef in the Lean beef, quinoa and beans were excellent value for £6.50, and so is the Harissa roasted chicken breast salad with couscous, rocket, currants, tomato and pumpkin seeds. I tried the Rare tuna loin with shaved vegetables and subtle oriental flavourings. At the lower price point are the Parma ham salad mentioned earlier, and a Roasted squash with feta cheese, cracked wheat, pine nuts, baby spinach and coriander. There are no startling combinations to frighten off regular Tesco shoppers; instead all the items are presented simply and beautifully with the high quality ingredients singing out. I watched lunch shoppers hover, attracted by the offer, but not confident enough yet to grab and go, like in a Pret. I’m sure that will come. The little corner of the store with its 1930s music for atmosphere will surely grow. The Euphorium cakes have borrowed more from Peyton and Byrne than standard sandwich bar fare. Whole decorated cakes can be taken away (good for office birthdays). Towers of Victoria sponge, jam and cream set a mainly British tone, but they are not averse to an eclair either. I was longing to try the Euphorium croissant, which I had been told “is to die for”. And dear reader, I have to tell you it is. First, you see multiple fine layers of pastry and then you bite into a crisp but chewy delectable butteriness. Why has the quest for the perfect croissant constantly drawn me to Paris when there is a source nearby, in Islington? There are also opportunities for other small producers to benefit from the expansion. The Euphorium apple juice is made by the excellent Chegworth Valley, and a range of Posh Pop from Breckland Orchard with titles like Sloe lemonade and Ginger beer with chilli are sold alongside. And in Harris & Hoole with the coffee are teas from the boutique American brand Rishi. The partnership with Harris & Hoole is different to the one with Euphorium. Whereas Euphorium has been an independent business since 2006, H&H was started specifically for Tesco by the owners of Taylor Street Baristas, a six strong chain of high quality coffee bars in central London. Tesco was apparently at first keen on buying the Taylor Street brand, but the sibling owners refused. However, you don’t just throw away such a good business connection, so they sensibly offered instead to make them a new chain in a similar mould as theirs, from scratch. The Tolleys looked to the London 17th century coffee houses for inspiration for the Harris and Hoole name, and found a mention in Pepys diary of 1664 describing a visit to one in Covent Garden, where he met up with two companions with these alliterative names which roll easily off the tongue. While Euphorium has the advantage of being safely positioned inside the Tesco stores, the Harris & Hoole unit in Tooley St is accessed independently at the side of the premises, albeit with an additional inconspicuous door inside the entrance to the supermarket. Its position would quite a tough call for a small business, competing as it does with Costa directly on the other side of the supermarket entrance. And in terms of its sandwiches, it competes with Euphorium. On my way back I stopped off at the new standalone Cannon Street branch of Harris and Hoole. The premises here is huge for a business set up for mainly selling coffee. If this had been an independent first business, it simply would not stack up. I felt that the food on the counter was thinly spread to fill the space. How much space do a couple of espresso machines take up really? The sandwiches were arranged on wooden boards, but not piled high at the beginning of a lunchtime rush. It was 12 noon. Although the Tolleys are expert in what they do, I feel they have the tougher job. Euphorium have their own bakery products at the heart of what they sell. H&H are relying on outside sources for their food and the sites chosen so far may be restrictive. The big question remains, whether Tesco can partner with these independents productively and profitably without killing off the qualities which made them successful in the first place? The essence of a small business is surely the hunger felt by the owners for success and profit. Where this is removed, and investment is plentiful, there may be a danger of the edge being softened. It’s a fascinating story to follow.